A Call to Artists is underway for the creation of an original landmark sculpture to be placed at the roundabout planned at the intersection of Orange Avenue and Ringling Boulevard in downtown Sarasota, the City of Sarasota has announced. The sculpture will become part of the city’s permanent public art collection, a news release notes. Specific details about the project, including the budget and the application and selection processes, are posted at www.CallForEntry.org, the release notes. “Artists with a proven track record of creating significant outdoor public art commissions” that can withstand the Florida elements are encouraged to apply, the release continues. The deadline for submissions is June 5. The piece should be of high quality and freestanding. It should complement the Orange Avenue-Ringling Boulevard roundabout location. It should require minimal maintenance; “(no water features),” the release emphasizes. It must be an original design. It can be appreciated from a distance; “(does not draw people toward it),” the release adds. It must not exceed 20 feet in height. It must not display messages or contain signs, flashing lights or other similar features, the release indicates. The project budget cannot exceed $150,000. Each artist is required to submit his or her qualifications, a digital image and a brief description outlining the initial concept for the project, the release continues. 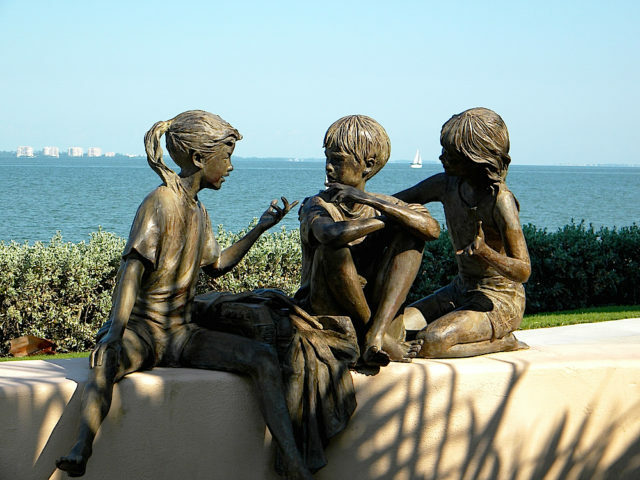 Images of completed works within the city’s public art collection may be reviewed at www.SarasotaGov.com. Three finalists will be invited to present their proposals to the Public Art Committee, the release says. That committee will make a recommendation to the City Commission. Submissions review by Public Art Committee: July. Finalists’ presentations to Public Art Committee: September. Recommendation presented to City Commission: November. 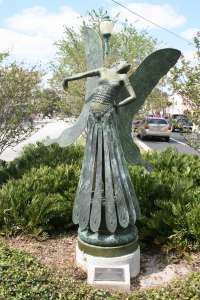 “Staff members with the Neighborhood and Development Services Department, which oversees the public art program, are coordinating this public art project far in advance of the construction of the Orange Avenue/Ringling Boulevard roundabout, to ensure the sculpture is ready for installation when the roundabout opens,” the release explains. Construction of the roundabout is expected to begin in the summer of 2017, the release adds.